Recently, the Feed Enzyme Engineering team from Feed Research Institute of Chinese Academy of Agricultural Sciences (CAAS) have developed a versatile method coupling expression of the red fluorescence protein (DsRed) in T. reesei and fluorescence-assisted cell sorting (FACS) of germinated spores. This method was first established by coupling DsRed-FACS high-throughput screening, which allowed us to the fast isolation of cellulase hyperproducers from mutant T. reesei library. It greatly improves the screening efficiency and cost-saving, and is beneficial to the actual production needs as well. The research results were published on Biotechnology for Biofuels. In the biofuel industry, cellulase plays an indispensable role in hydrolyzing cellulose into fermentable glucose. Trichoderma reesei is a saprophytic wood-decaying filamentous fungus with prominent ability to produce cellulase. While classical mutagenesis and modern multiplex genome engineering are both effective ways to improve cellulase production, successful obtaining of strains with improved cellulase-producing ability requires screening a large number of strains, which is time-consuming and labor intensive. These characters dwarfed the endeavors to establish high-throughput screening methods. Herein, we establish a new high-throughput screening method. 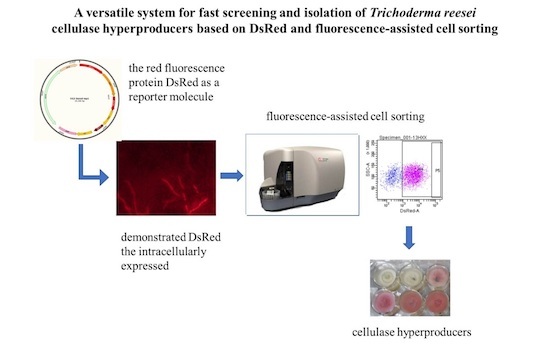 Specifically, we used the red fluorescence protein DsRed as a reporter molecule and demonstrated that the intracellularly expressed, and more importantly, surface-displayed DsRed coupled with FACS can be used for high-through-put screening of cellulase hyperproducers from T. reesei progeny libraries generated by random mutagenesis or genetic engineering. Our results may provide a robust engineering framework for future efforts to engineer T. reesei, and other industrially important filamentous fungi as well, for enhanced secretion of cellulase and other valuable proteins.